If you’ve ever visited Ukraine on holiday, you’ve probably experienced the majestic architecture of the many cathedrals and monasteries and the adventure-packed (though relatively modest in terms of height) mountain ranges – whether you went skiing, hiking, mountain biking or rock climbing (and you definitely have to do at least one of those in Ukraine!). Ukraine is also home to over 800 institutes of higher education and has a varied economy, concentrated mostly in and around big cities such as Kiev, Zaprozhye, Dnepropertrovsk, Lviv and Odesa. It also has significantly lower tuition fees than many countries, both in Europe and worldwide. So, whether you’re a history buff, nature lover or a future entrepreneur, opportunities to study in Ukraine could be just what you’re looking for. Tuition fees for a bachelor’s degree start at around US$2,500 per year. Living costs are very affordable – you will need only around US£1,500-2,500 per year. Borschtis the national soup of Ukraine, a vibrant red beetroot soup. Traditional Easter celebrations include pysanky– drawing on eggs with wax and dyes to create a pattern. Undergraduate degrees at universities in Ukraine usually take four years to complete. Languages used for instruction include Russian, Ukrainian, English and French (for medical programs only). International applicants may need to take a language proficiency test or attend the preparatory faculty for one academic year to study Russian and/or Ukrainian. Students studying in English or French do not need to attend the preparatory faculty but can study the language as an independent course during their degree program. Make sure to check the language(s) your course will be taught in before you apply. Six universities in Ukraine are featured in the QS World University Rankings® 2018, while a further eight are included in the QS EECA University Rankings 2018. Read on for a quick overview of the top three. N. Karazin Kharkiv National University is the highest-ranked university in Ukraine at 401-410. Located in Kharkiv, it’s also the second-oldest university in the country (established in 1804) and ranks third in the EECA ranking for the international students indicator, and 53rdoverall. Ranked 34th in EECA and in the 411-420 range of the World University Rankings, Taras Schevchenko National University of Kyiv is located in the capital city of Kyiv (also often spelled Kiev) and is often considered one of the country’s most prestigious universities. It’s home to over 26,000 students and holds bilateral partnership agreements with 227 foreign educational and scientific institutions from 57 countries. National Technical University of Ukraine "Kyiv Polytechnic Institute" is ranked 501-550 in the world and 49th in EECA this year. Founded in 1898, it now has a large student body (over 36,000 students) at its two campuses in Kyiv and the town of Slavutych. The institute is the alma mater of a number of prominent engineers and scientists, including Sergei Korolev. As the capital of Ukraine, Kiev doesn’t disappoint when it comes to providing plenty of things to do. From the vast range of museums (including a History of Toilets museum), to concerts and exhibitions, stadiums, theaters, cinemas, pubs and the full spectrum of nightlife, ample entertainment is available. Many universities in Kiev also offer sports fields, gyms and swimming pools near their dormitories so you’ll never be at a loss for something to do. If you’re looking for a quiet place to relax after a long lecture, Kiev is also a popular health resort destination and is well-populated by natural parks, including Oleksandriya – a 200-year-old park in Bila Tserkva. Taras Schevchenko National University of Kyiv is the second highest-ranked university in Ukraine, in the 411-420 range of the QS World University Rankings® 2018, while Ukraine’s third-highest university is also based in Kiev: the National Technical University of Ukraine "Kyiv Polytechnic Institute" (ranked 501-550). Students at universities in Donetsk benefit from its stunning architecture and intellectual atmosphere. Industrial tourism enthusiasts will also enjoy the lengthy rows of metallurgical construction dotted with numerous smokestacks. For those more inclined towards natural features, Donetsk has plenty of green spaces, along with six bodies of water, including the First City Pond. During your studies, make sure to take the bridge over this pond to enjoy the view across the city and watch the local anglers, who catch small fish to sell by the bag on the spot. Donetsk has many national universities, including the Donetsk National Medical University (ranked first among Ukrainian medical universities according to the Ukrainian Ministry of Education), the Donetsk National Technical University, the Donetsk National University of Economy and Trade, and the Donetsk National University (ranked 801-1000 in the latest QS World University Rankings). The city is also home to the Donetsk State University of Management, which is well-regarded for management and related subjects. Kharkiv is known for its community of Russian-speaking academics and intelligentsia, and also for its lively rock and alternative music scene. Universities in Kharkiv (or Kharkov in Russian) include 13 national universities as well as numerous other higher education institutions. The city is home to the highest-ranked university in Ukraine in the QS World University Rankings 2018, V. N. Karazin Kharkiv National University (ranked 401-410). Other universities in the city include the National Technical University “Kharkiv Polytechnic Institute” (ranked 701-750), Kharkiv National Automobile and Highway University, Kharkiv National Medical University and Kharkiv National Aerospace University “Kharkiv Aviation Institute”. 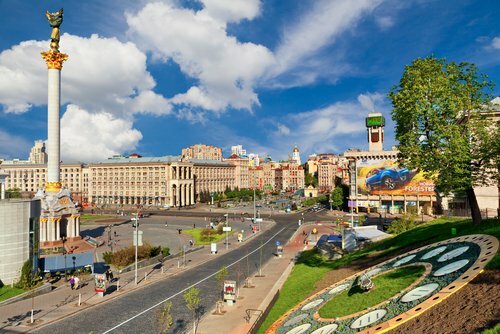 Kharkiv has a large international student population, so you’ll be sure to find someone as new to the city as you, and the cost of living here is also lower compared to other Ukrainian cities. Why not pay a visit to Kharkiv’s own version of a German biergarten in Stargorod, where they serve fresh lager and ale made in an on-premise microbrewery, with mountains of meat and traditional music? Odesa (or Odessa in Russian) is known for its museums, parks and beaches, but perhaps most famously (The Battleship Potemkin, anyone?) for its celebrated Potemkin Stairs, a giant stairway considered a formal entrance into the city from the direction of the sea. If you don’t fancy the climb to the top, there’s a free funicular railway that runs parallel to the stairs. If you’re more of a night owl, Odesa may be just what you’re looking for, with uniquely styled dance temples and chill-out zones not far from the Black Sea, including a nudist beach and Arkadia Beach with its old-school arcade games and a variety of cafés, bars and clubs. Odesa also has a thriving alternative scene with several venues hosting indie bands and local DJs. Universities in Odesa include the V. Nezhdanova Odessa State Musical Academy, the oldest musical educational institution in Ukraine, Odessa National Medical University and Odessa National Economic University. In order to study in Ukraine, international students need an invitation letter that confirms their admittance to their chosen university. You can obtain an invitation letter directly through the university, or through one of many organizations that provide this service for both January and September intakes. There’s usually a charge for this service, which can cost around US$300 for bachelor’s programs and US$400 for master’s and PhD programs. If you do use an agency, make sure the organization you choose is authorized by the Ukraine Ministries of Foreign and Internal Affairs. To apply for an invitation letter, students need to provide a copy of their passport, a copy of their school leaving certificate (this will be a certificate of your most recent educational achievement), and a completed application form. Generally, it takes around two to four days for an invitation letter to be processed. The invitation letter is an official document, referred to either as a Visa Support Document or an Official Invitation. It may be countersigned by the Ukraine Ministry of Education and Sciences, Youth and Sports, will be processed by the Ukraine Ministry of Foreign Affairs, and is required by the Ukrainian Embassy before they can give you a student visa for Ukraine. The invitation is valid for 90-180 days from the date of its issuance, so make sure you apply for a visa within the right timeframe. Students from Armenia, Azerbaijan, Georgia, Moldova and Uzbekistan do not require a visa to enter Ukraine for an indefinite stay. Students from Andorra, Belarus, Canada, European Union countries, Iceland, Japan, Liechtenstein, Macedonia, Monaco, Norway, Russia, San Marino, Switzerland, South Korea and the US also do not require visas for stays up to 90 days. Everyone else will require a visa to study in Ukraine. You may also require details of your permanent address and term-time address, so make sure you have these written down or memorized. The Ukrainian embassy will translate the documents for you and notarize/certify them, either using a stamp or a signature. You must present the documents along with a migration card filled in at the Ukrainian airport. The migration card is an important document handed out by the flight attendant on the plane, and is also available at immigration control at the Ukraine airport. You’ll have to fill in a card with two identical sections, both of which the immigration officer will stamp. The officer will retain one card and give you the other. Remember to put your migration card in a safe place as you’ll need it when you leave Ukraine. You will need to inform either your agency or university of your arrival in advance so that a representative can meet you at the airport. Tuition fees in Ukraine will vary depending on your chosen degree and institution. Universities in Kiev are likely to be slightly more expensive than in other cities. Some students may also find their first year costs more than subsequent years. Ukrainian universities may administer a tuition fee package which includes costs of textbooks, exams, assistance with opening a bank account and pick-up from the airport by a representative. You should generally expect to pay around US$2,500-5,800 per year for a bachelor’s degree, with preparatory courses costing around US$1,800. International students entering a Ukrainian university for the first time will have to pay the full fees for their first academic year upfront, and then can pay per semester for following academic years. Your university may also charge a one-off registration fee on arrival (around US$10-30). Most international students in Ukraine finance their stay without help from scholarships and, as such, Ukraine does not offer government-based financial aid. Many students choose to study in Ukraine due to its significantly lower total living costs compared to other European countries, with students only needing around US$2,500 per year to cover their costs of living. If you want to lower costs even further, accelerating your program either through transferring credits from your secondary education or taking additional courses is an option, and students with impressive grades may also be able to apply for a tuition waiver later in the year. You may also be able to gain funding from the government in your country of origin. Most Ukrainian students live in university-provided student accommodation in the form of hostels and dormitories. These come in various forms, and you’ll usually share your accommodation with one or two students. You could also choose to live in a flat off-campus with a small group of students, or stay with a Ukrainian host family. In this case, you must inform your university of your term-time address.